1. How many T-shirts do I need? 2. Should I cut the T-shirts before I send them to you? 3. I have a favorite shirt that I wore for years. There are torn and stained parts. Is that OK? 4. What is the filler? 5. What do you use for backing? 6. Will this quilt be washable? 7. Can I include other clothes? 8. Can I include non-washable items like baby shoes in my memory quilt? 9. I would like to include dry clean only items in the quilt. Is this a problem? 10. How can I hang it on the wall? 11. 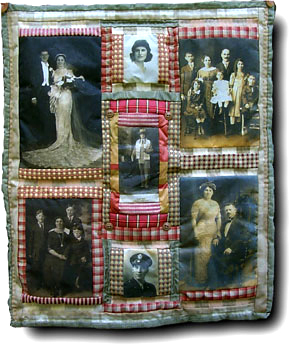 How much will the memory quilt cost? 13. What do the edges and quilting look like? 14. Will I get my photos back? 15. What kind of pictures work best? 16. Can you put invitations, menus, magazine and album covers on fabric? 17. Are photos on fabric washable? 18. How can I select the colors that you use in the project? 19. How much do photo projects cost? Q: How many T-shirts do I need? 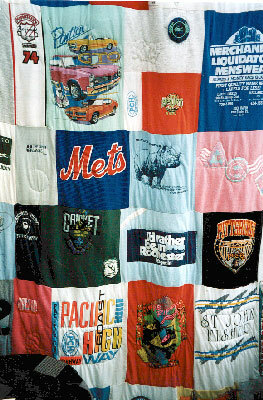 A: The size of the quilt depends on the number of T-shirts used. 12 shirts makes a sofa throw about 30"x 60", 30 T-shirts could be about 48" x 65". 40 T-shirts usually cover the top of a queen bed. As you can see from the pictures, I make a crazy quilt mosaic out of them so any odd number will work well. I use the logo or picture part only. If exact dimensions are important to you, let me know in advance. Q: Should I cut the T-shirts before I send them to you? A: NO. I'll do that for you. Let me know if there is something on the back or sleeve that you also want. Mark it with masking tape, or pin a note on any shirt that needs special attention. Q: I have a favorite shirt that I wore for years. There are torn and stained parts. Is that OK? A: No problem! One ot the advantages of having a quilt made from your favorite old shirts is that I can cut away ruined spots. If you have fabric badges/decals, I can sew them on a spot that can't be cut away. When the project is finished, you won't notice anyway. Just make sure that all T-shirts are freshly laundered and dry before you send them. Q: What is the filler? A: 100% polyester quilt batting. Q: What do you use for backing? A: Pre-washed T-shirt knit fabric in your choice of color. If you want this quilt to match a bedset exactly, just send an extra washed sheet. Knit jersey flat sheets work best. Q: Will this quilt be washable? A: I've washed mine for years. Make sure all of the T-shirts have already been washed a few times already. That will take care of shrinkage and bleeding of dyes. Wash in cool water, and dry at a low temperature. Very large quilts will require a large capacity machine. Q: Can I include other clothes? A: Yes! Let me know if you want just fabric squares cut from the clothes or if you want to see the whole pocket, cuff, strip of buttons, or vest front. Cotton flannel shirts, sweatshirts,and pyjamas work great. Q: Can I include non-washable items like baby shoes in my memory quilt? A: Why not? I can velcro them to a section of corderoy or denim, and you can remove them when you wash the quilt. In one of the pictures, you can see that I put baby shoes inside the pockets of the front section of overalls. Cute! Q: I would like to include dry clean only items in the quilt. Is this a problem? A: No. Just spot clean the quilt if necessary. Q: How can I hang it on the wall? A: I can sew a sleeve on the back if you request, and you can slide a curtain rod through it for hanging . Q: How much will a memory quilt cost? A: Nine dollars per T-shirt or clothing item. Batting and backing are included. Shipping and insurance are about $15.00 per quilt. A: I work alone and do all of the quilting by hand. I work on one project at a time, so I need a few weeks from the time you send me the T-shirts. Call me or E-mail me so we can talk about special requests. Your precious memory clothes remain in my house until the quilt is done. Don't be disappointed at Christmas time! Order your quilt in the early fall. Q: What do the edges and quilting look like? A: I hand roll and hand stitch the edges. I hand quilt around all the logos and pictures to give them definition and texture. Q: Will I get my photos back? A: Yes. Your photos are returned to you unharmed with your wall hanging or pillow. Since these are being sent in the mail, please make a copy of one-of-a-kind pictures. I return everything to you insured with a signature required. Q: What kind of pictures work best? A: The copy on fabric is only as good as your original. My favorites are those old black and white ones tucked away in old albums and boxes. Q Can you put invitations, menus, or magazine and album covers on fabric? A: Yes. Tell me if you want them copied enlarged or made smaller. 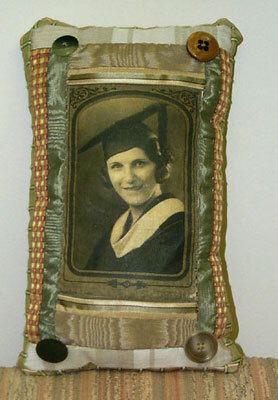 An invitation to a wedding made into a pillow makes a lovely gift for the bride and groom. Q: Are photos on fabric washable? A: Yes, but the pillow or wall hanging that I make for you will look best with my rich upholstery, velvet, silk, and decorator fabrics that are not washable. Just spot clean, or wipe with a soft cloth if it gets dust on it. Q: How can I select the colors that you use in the project? A: If you can't visit my studio just send swatches, if you have them, of the colors you like. Tell me the color schemes you prefer, or get those little paint cards from the paint store, and circle the colors that you like. If you want an exact match to your sofa or chair, why not sent one of those arm covers, and I'll be able to match those colors when I select fabric. Q: How much do photo projects cost? A: The price for putting the photos on fabric depends on the size of the photos.